Click the “File” menu, choose “Import”, and then choose “Import PDF”. Choose “Import PDF as Images”, and click the “OK” button. Browse to the PDF Export file on your computer, and select it. Then click the “Open” button. See ACI’s instructions on how to do this here. Click the “Insert” menu, and choose “Import from PDF File”. Under “Select PDF Pages to Insert”, select “All Pages”. Under “Insert into…”, choose either “New Legal Size” or “New Letter Size” to match the paper size used in your Dynamo MC PDF Export. Click the “Insert” menu, and choose “Document From PDF”. Click the “Browse” button and locate the PDF Export on your computer. See a la mode’s own instructions on how to do this here. Click the “Add” menu, and choose “Document From PDF”. Other appraisal software should be able to import our PDF documents if it includes a PDF import feature. Don’t see your appraisal software above? Please let us know by sending an email to support@dynamoappriaser.com and we will assist you. Depending on which appraisal software you use, you may experience some quality loss when importing due to an overuse of image compression. Often the compression that these software packages use is tuned to work best with images, but not charts or written text. Unfortunately, this is out of our control. If you experience problems with this, we strongly encourage you to contact your software vendor and request that they provide you with better control over compression when importing PDF documents. What about this supplemental information? There are a few calculations that do not fit onto the forms within the PDF export. We show you this information at this point so you can manually enter this information into your appraisal report. 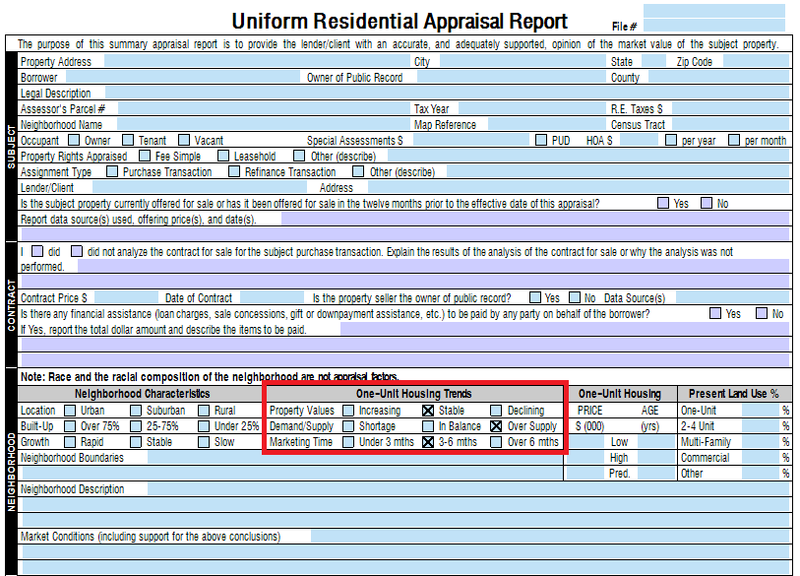 Review the information presented to you and click the corresponding boxes in the “One-Unit Housing Trends” box in the neighborhood section of URAR (page 1) within your appraisal (as shown below). 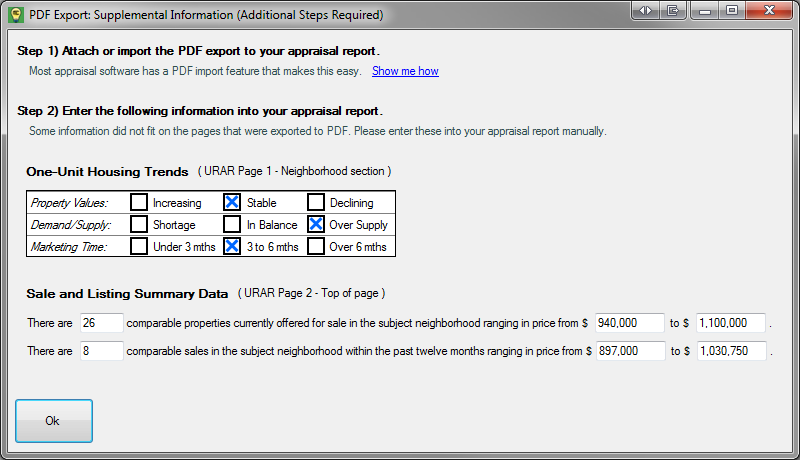 Copy the information presented to you into the very top of the URAR (page 2) within your appraisal (as shown below).